I was already an independent and financially self-sufficient young woman when I met my husband. Many questions intrigued me about how will be our life living together. Will our love last forever? How many kids will we have? What parenting style will we implement? How will we manage our finances? And many more. My questions about finances were ones of the toughest because, being a witness of domestic financial abuse, I was striving to prevent it from happening in my life, so I needed to be sure that whether we chose managing money jointly or any other choice we made, I would keep my financial independence. I talked to my mother and closest friends about my feelings regarding the financial issue, but their answers confused me more. While my mother advised me to share expenses and financial goals keeping some money aside in separate accounts, my friends would assure that this should not be an issue since “all income earned during your marriage can be considered as shared money in a divorce”. With this confusion in my mind, I started to navigate through my relationship and once I was ready to take the big step my husband and I started to try different money management styles. There is no a ”one size fits all” style, and you would benefit by trying to figure which money management style is better for you. I didn´t start out with the intention to identify a safe money management style for moms, but since I´ve tried different finances methods, I can tell which are safe. Money Management Style for Moms: are all of them safe? When you and your husband decide to keep your accounts separate and choose to divide the expenditure, you are managing your finances completely separately. The division could be done by item (who will pay for the groceries, cable, electricity) or by identifying a percentage of the income each one has to provide, according the expenses you do each month (You´ll pay 60% of the expenses while he will pay 40%). I´ve tried this method and even though it is risk free of financial abuse, it also leaves you with the feeling that you´re not working as a couple toward a common goal; that no matter how hard you try you won’t go too far until you start planning together. This style demands that you and your spouse have all your accounts together. Since you both will need to deposit your income and make the payments from the shared accounts, this is one of the simplest ways to manage your money as a couple. When my husband and I started living together we used this method for almost a year, but it didn´t work for us. Since you both have access to see everything your partner spends, it could lead to unnecessary questions and arguments, as it was our case, so we quit it. 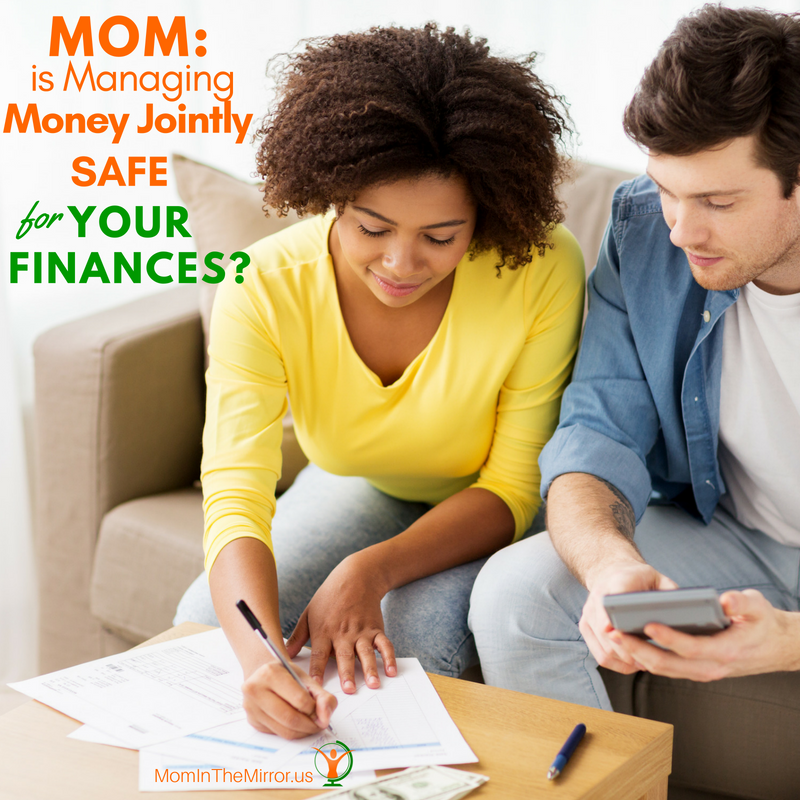 I´m glad we stopped managing money jointly because it is not a safe money management style for moms and it is one of the most dangerous styles when it comes to financial abuse. If you both have good communication and same financial goals, this could be a good method to follow, however, having your accounts jointed makes you more vulnerable to be a victim of financial abuse. If your husband decides to take control of your finances it is easy for him to withdraw the money and any other financial resources you both have, leaving you with nothing. Having joint accounts where you both share budget expenses, savings, retirement plans and also have separate accounts for each one to manage freely as you desire is what this money management style is about. This is the style my husband and I are actually applying. The way we do this is having a joint account where we deposit our income as it is, and then, from that account we do the monthly payments and transfer the money that goes to savings and to our separate accounts. We both also have a separate account for each of us where we deposit a monthly amount that is intended for our personal expenses and none of us can interfere in the way each one choose to use that amount. This is a safe money management style for moms and I could tell this is the safest and more family oriented way I´ve found for moms like you and me to manage our finances as a couple, while preventing financial abuse. Because it gives you the possibility to share your financial goals and responsibilities and at the same time it allows you to keep some financial independence. In this style either you or your husband is the sole responsible for managing the finances of the family. When you choose him for this job, all the accounts are on his name and he´s the one that pays the bills and manage every penny. When you are a stay at home mom, giving your husband the management of your finances completely seems to be like the most reasonable option since he´s the one that brings the money, but it is not necessary true. There was a time when I was at home without earning any income for a few months, my husband (who had a formal job then) and I decided that he had to give me a monthly allowance for my personal expenses because of all the work we moms do for our family when we´re at home. Whether you work or not, delegating all the financial responsibility to your husband is not a safe money management style for moms, and it could be very risky and really dangerous for financial abuse. Once he has the sole control it is easy to exert his power if he is up to it. After reading this money management styles and how they could impact your financial self-sufficiency, you may be thinking “That´s okay, but I can´t live my life like if financial abuse will happen to me. I’d cross that bridge when I come to it. I won’t live for the worst-case scenario”, and you may be right by thinking like that. However, the same way any cancer survivor would advise you to get doctor check-ups, and the same as a mom advise her children not to use the scissors to prevent them from cutting, the same way I invite you to take the necessary steps to prevent financial abuse in your life, even when you think you don´t need to. What money management style do you use as a couple? And why do you think it would be good to keep/change it?